Russell Zavalla, a 2006 member of Capital Regiment, sent this picture. This picture was taken on the day of the 2006 World Championship Finals with five of the 11 members from Stephen F. Austin High School (Sugar Land, Texas) who marched as members of Capital Regiment. We wanted to show our pride for Texas so our friend Aaron sent out for a flag which we hung up with a bamboo stick in our bus windows. 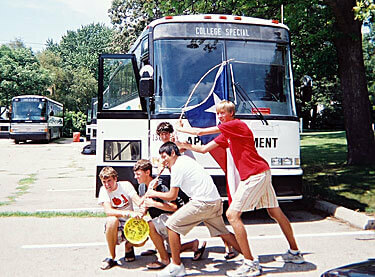 Pictured: Greg Muth (with Frisbee), Nathan Coppinger (black shirt), me (white shirt), Andrew Martinez (back), Aaron Powell (red shirt).